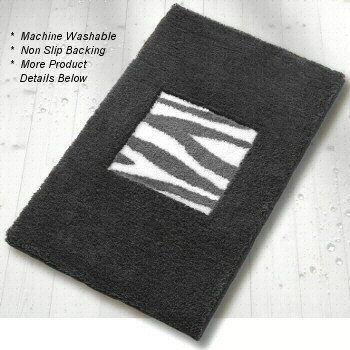 A subtle animal print touch in this bathroom rug design is just enough to add a little extra interest to your bathroom design. High quality, dense, very soft high pile 25mm / .98in rug. Slate Grey: Beautiful slate grey background with lighter medium tone grey animal pattern in the center. Taupe: Taupe beige background with lighter beige and white animal pattern in the center. Elongated lid covers for the Safari bath rug are a solid color and correspond to the background color of each rug swatch.